RestKit is an Objective-C framework for iOS that aims to make interacting with RESTful web services simple, fast, and fun. It combines a clean, simple HTTP request/response API with a powerful object mapping system that reduces the amount of code you need to write to ‘get stuff done’. RestKit’s primary goal is to allow the developer to think more in terms of their application’s data model and worry less about the details of sending requests, parsing responses, and building representations of remote resources. A simple, high-level HTTP request/response system. RestKit ships with an HTTP client built on top of NSURLConnection and provides a library of helpful methods for inspecting MIME types and status codes. Submitting form data is as simple as providing a dictionary of parameters and a native params object is included for easily creating multi-part submissions. Simple support for the streaming upload of large files (i.e. videos) is also provided. Framework level support for switching servers & environments (e.g. development, production, staging). RestKit uses a base URL and resource paths rather than full URL’s to allow you to switch target servers quickly. Interpolating URL strings and constructing NSURL objects is a thing of the past. An object mapping system. RestKit provides a modeling layer for mapping processed data payloads into native Cocoa objects declaratively. This lets the application programmer stop worrying about parsing and simply ask the framework to asynchronously fetch a remote resource and call the delegate with the results. Object mapping is implemented using key-value coding, allowing for quick traversal of the parsed object graph. Reflection is used on the property types to allow for mapping from values that don’t have direct representations in the encoding format, such as mapping JSON timestamps encoded as a string to NSDate objects. Core Data support. Building on top of the object mapping layer, RestKit provides integration with Apple’s Core Data framework. This support allows RestKit to persist remotely loaded objects directly back into a local store, either as a fast local cache or a primary data store that is periodically synced with the cloud. RestKit can populate Core Data associations for you, allowing natural property based traversal of your data model. It also provides a nice API on top of the Core Data primitives that simplifies configuration and querying use cases. Database seeding. When the Core Data object store is used, you can seed a database from a collection of data files. This lets you submit your apps to the App Store with a database in the app bundle that is ready for immediate use. Pluggable parsing layer. RestKit currently supports JSON via the SBJSON and YAJL parsers. Parsing is implemented behind a simple interface to allow additional data formats to be handled transparently. Rails integration. RestKit was originally designed as an Objective-C answer to Active Resource. Rails has been used as the backend for a number of RestKit powered iOS apps and turn-key support is provided for interacting with a backend Rails application. Experimental Three20 integration. RestKit is often used alongside the Three20 framework. An optional module is included in the distribution that allows RestKit to interface with Three20 via the TTModel protocol. RestKit is available as a downloadable binary package, as a versioned snapshot, or as a Git submodule if you wish to track mainline development. For users of the library uninterested in doing development, we recommend using the versioned binary packages for the simplicity of installation. If you wish to install as a submodule or build the library yourself, please refer to the documentation available on Github. Head to restkit.org and download the latest version (v0.9.0 as of this writing). Unpack the archive wherever you like to keep libraries (the author recommends a Library subdirectory). 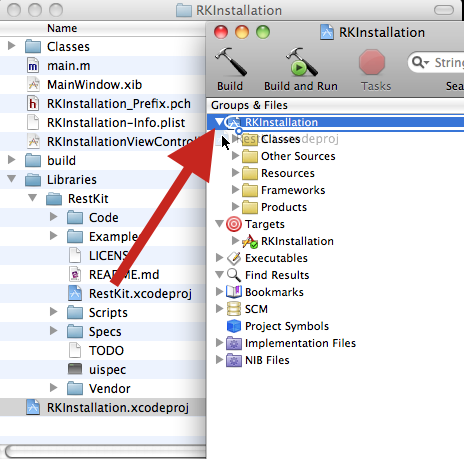 Drag the RestKit.xcodeproj file to your Xcode project file. It will be added to the Groups & Files section in the left pane of the project. Select the appropriate targets and click ‘Add’ when the sheet appears. Find the target for your application in the Targets section of your project. Right click on your app’s target and select ‘Get Info’ from the menu to open the target Info inspector window. You should be looking at the General tab of your target’s inspector. In the top Direct Dependencies section, click the plus button and add a direct dependency on the RestKit target. CFNetwork.framework – Required for networking support. SystemConfiguration.framework – Required for detection of network availability. MobileCoreServices.framework – Required. Provides support for MIME type auto-detection for uploaded files. 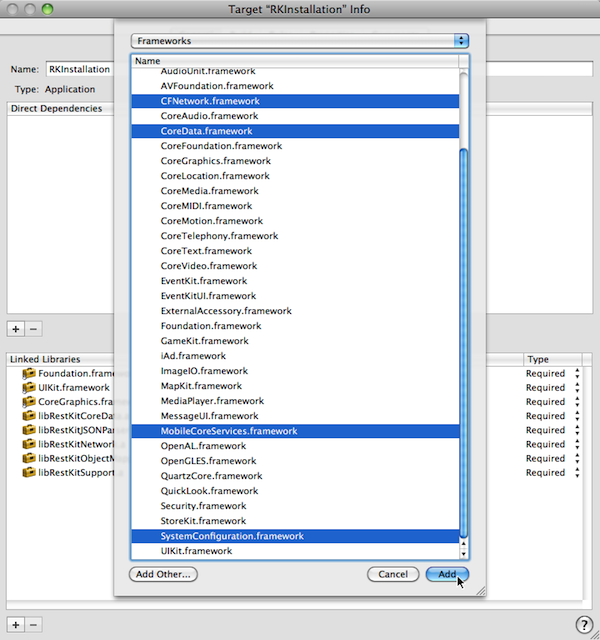 CoreData.framework – Required. Required for use of the Core Data backed persistent object store. Switch to the ‘Build’ tab in your project inspector. Make sure that your Configuration pop-up menu reads All Configurations so that your changes will work for all build configurations. Find the Header Search Paths setting. Double click and add a new entry. When RestKit is compiled, it will copy all relevant headers to the appropriate location under the /Build directory within the RestKit checkout. 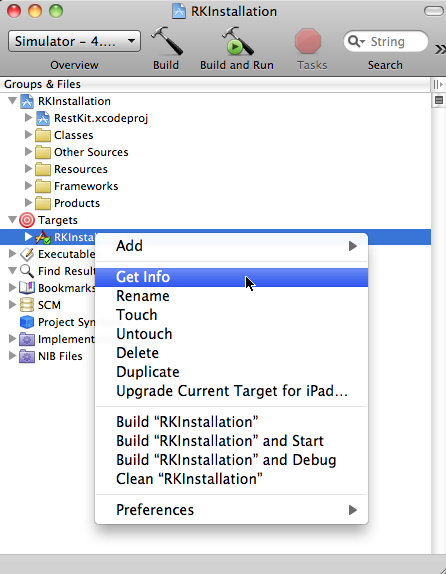 You need to add a path to the /Build directory of RestKit, relative to your project file. For example, if you checked the submodule out to the ‘Libraries’ subdirectory of your project, your header path would be ‘Libraries/RestKit/Build’. Now find the Other Linker Flags setting. Double click it and add entries for -all_load and -ObjC. Your setting should match the screenshot below. Close out the inspector window. Congratulations, you are now done adding RestKit into your project! Build the project to ensure everything is working correctly. Once you have verified that you have RestKit linked into your project correctly, you are ready to begin using the library. RestKit is designed to make common tasks as straightforward and simple as possible. In this section we will run through many common tasks in the library and focus on code samples to help you get started with the library. All of RestKit’s higher level functionality is built on top of the network layer. The network layer’s primary responsibility is the construction and dispatch of requests and the processing of responses. Generally you will dispatch all requests through the RKClient class. As you can see, the code is extremely succinct and readable. There are a number of helper methods available on RKRequest and RKResponse that make inspecting your request state very easy. Be sure to read the headers and get familiar with what’s available. Sending a request to a remote web service. Getting back an XML or JSON response and parsing it. Taking the parsed response and assigning the values inside the payload to objects. Much as RKClient is your gateway to a simpler life with HTTP, RKObjectManager is your gateway to the world of object mapping. 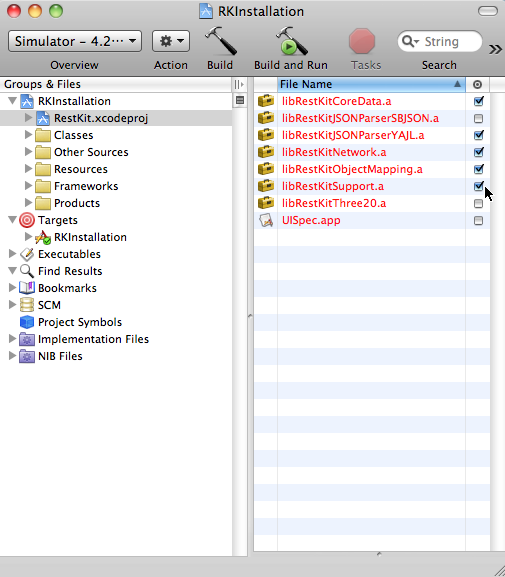 In fact, on projects where object mapping is used extensively you will initialize RKObjectManager instead of RKClient. Much as RKClient seeks to abstract away the gritty details of handling requests, RKObjectManager works hard to shield you from the complexities of transforming data payloads into objects. Object mapping requires that you provide a data model class to represent your remote objects. By implementing the RKObjectMappable protocol, you are configuring RestKit to map attributes within a retrieved payload to properties on your model class. The key to this process is the elementToPropertyMappings method, which defines a dictionary of key paths and property names. The key paths are key-value coding compliant strings for accessing data within a parsed document. The property name is simply the string name of a property on the class to assign the accessed data to. As you can see, the entire process is very low ceremony and completely DRY. 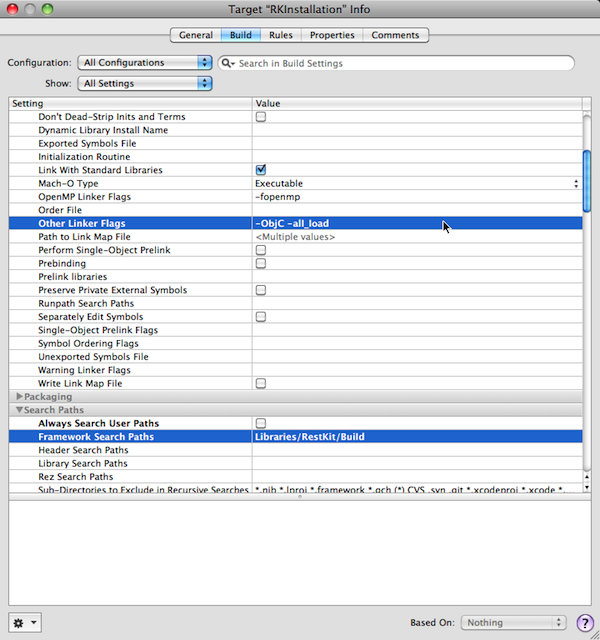 The notable piece in the configuration is the use of parentheses in the resource path for the default route. Within the parentheses you can specify any instance method on the class being configured and when RestKit generates a resource path for that object, the value returned will be interpolated into the string. In our example above, we can see that GET, PUT, and DELETE operations will generate /contacts/1234 while POST will generate /contacts. What we have done here is used the combined power of object mapping and routing to perform very high level manipulations on local and remote objects. Behind the scenes, RestKit has identified the appropriate resource path for your operation, created and dispatched an asynchronous request, and processed the response for you. Client and Object Manager. 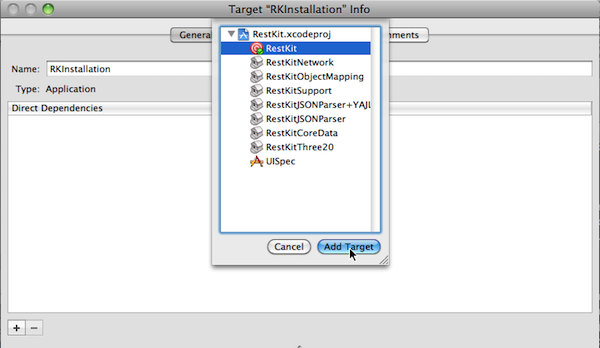 There are two primary entry points for working with RestKit in your application: RKClient and RKObjectManager. RKClient is the primary entry point when you are working with the Network layer of RestKit and concerns itself with the low level details of building and sending requests. RKObjectManager operates at a higher level of abstraction in the Object Mapping layer and concerns itself with the loading and manipulation of objects that represent remote resources. Depending on what you are trying to accomplish with RestKit, you will be working extensively with one (or both!) of these classes. Base URL’s and Resource Paths. RestKit uses the concepts of the ‘Base URL’ and ‘Resource Path’ to coordinate access to remote object representations. The Base URL is simply the common part of all URL’s to your remote application and is used to initialize instances of the RKClient and RKObjectManager classes. A resource path is simply the path (or subpath) portion of the full URL to an HTTP resource. Given an RKClient object initialized with ‘http://restkit.org’ and a request to GET the content at resource path ‘/foo/bar.json’, RestKit will create and send a request to ‘http://restkit.org/foo/bar.json’. This allows you to easily support development, staging, and production environments in your applications by conditionally compiling different base URL’s. Most of the time you will think entirely in terms of resource paths once you have moved beyond initializing the library. // where the Comment has a relationship to an Article.